The M&P isn't Smith & Wesson's first endeavor into striker-fired double-action-only pistols. They were making the Sigma Model as early as 1994 and the SW99 Series began production in 2000. I personally own a Sigma SW40VE and its been a consistently sturdy and reliable weapon for many years now. Now the Sigma has had a colorful past. Early Sigma pistols bore so much similarity to Glocks that users could reportedly interchange many parts between Glock and Sigma models. 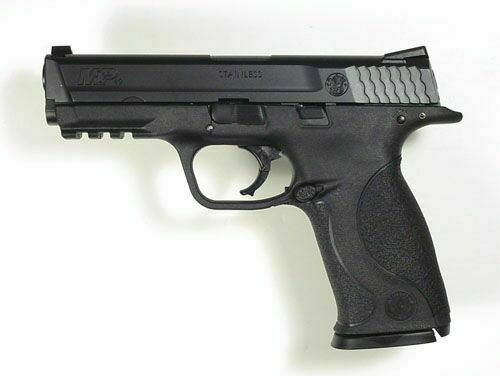 The similarities were so great that many referred to the Sigma series as 'Swocks', a contraction of "S&W" and "Glock". As a result, Glock initiated a lawsuit against Smith & Wesson, which paid an undisclosed sum to Glock for infringement of their patents. S&W then received the rights to continue the production of Sigma line but they had to redesign the pistol's trigger mechanism so that it did not infringe upon Glock's patents. Today, just about every major manufacturer is producing a polymer frame, double-action-only striker fired pistol - companies such as Smith & Wesson, Kahr Arms, Heckler & Koch, Beretta, Springfield Armory and of course, Glock, just to name a few. So, it would take a jump in design, performance, features and style to get ahead of pack, and the Smith & Wesson M&P may just be that jump. Slide and barrel Black Melonite finish. As much hype that has been given to this gun as a radical new departure; a "pistol for the new century", I see it more as a series of good improvements on a decades old design. Take the slide for example. Comparing the M&P to the older sibling Sigma SW40VE, at first glance the slides from top to bottom look functionally the same; clean and uncomplicated. But closer examination shows several improvements on the M&P slide. First, the external extractor is elongated and tightly fit into the side of the slide, eliminating openings found in the Sigma design that would collect residue and dirt. 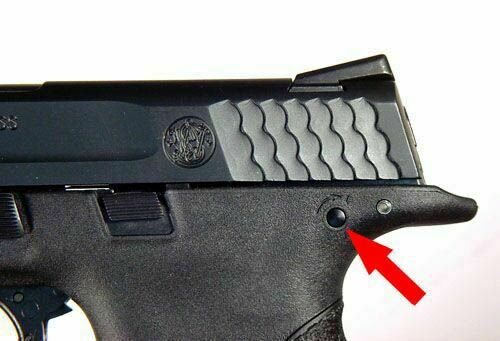 The front sight on the M&P slide is now dovetailed like the rear sight, not permanently molded into place as it is in the Sigma design. The visual appearance of the M&P slide is greatly improved over the Sigma slide as well. 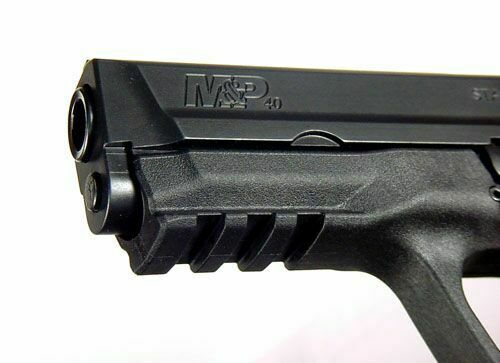 Trimmed down with rounded edges and long horizontal lines, the M&P slide is much slimmer than the square and boxy Sigma slide. And then there's the characteristic "fish-scale" serrations of the slide grips, giving the slide's finish more detail. 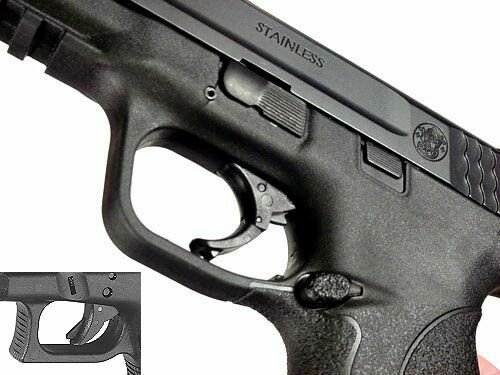 The M&P's single-action trigger is identical to the Sigma with it's lever-action trigger safety, but the trigger action itself has been greatly improved over the Sigma design, reducing the pull weight to 6-1/2 lbs, almost 3 lbs less than that of the Sigma. Another feature improvement is the adjustable grip. By swapping out an interchangeable palmswell, you can adjust the grip size for small, medium or large hands. The palmswell insert is locked onto the grip with a special retainer pin that can also be used as a tool to assist with the removal of the slide for cleaning and service. Other features include an accessory rail, an optional integral lock, a reversible magazine release and recessed control levers. And, as should be with all new pistol purchases, the M&P is supplied with two 15-round magazines. Getting past the initial problems we had with our gun, I must say the pistol has a great appearance and feel. The polymer frame is fit and trim. The Black Melonite finish on the slide and barrel is smooth and has a polished look. Parts fit together tightly with virtually no rattle or shake. 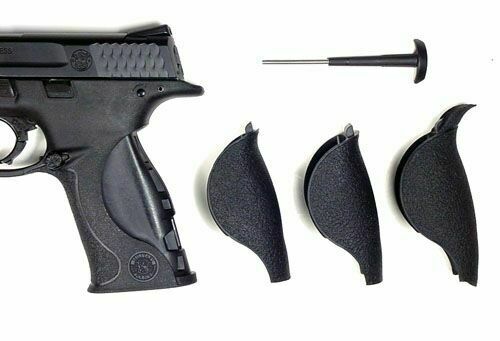 The gun is well balanced, and given three choices of grip size, you are almost guaranteed a perfect fit to your hand. Trigger pull is a consistent 6-1/2 pounds and is very easy to get used to. The slide is easy to grasp and racking the slide is effortless. For those of you who are familiar with Sigma model, you know how awkward, and even painful it is to take-down the pistol for cleaning. Trying to manipulate the two little serrated-blade-like buttons on both sides of the frame while retracting the slide can be frustrating to say the least. 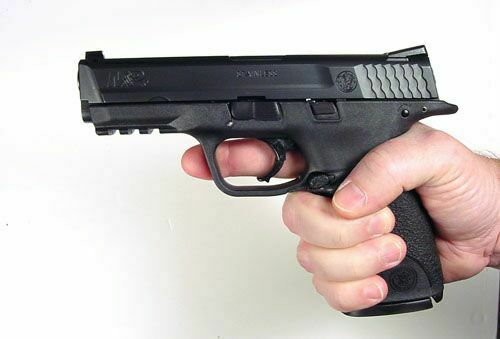 Smith & Wesson has finally moved up to a single-side rotating take-down lever on the M&P, and it is greatly appreciated. The recessed control levers definitely provide a snag-free, slim profile conducive to concealed carry. But, I found it difficult to easily release a locked-open slide with my thumb in a single-handed fashion. The slide lock lever's small, flat profile takes some getting used to. The M&P is indeed a fun gun to shoot. It has an extremely comfortable grip and a more-than-adequate grip tang to protect your hand. 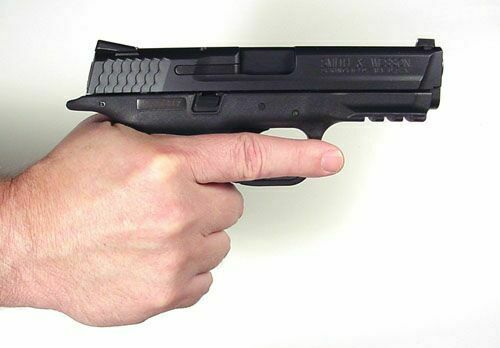 The perceived recoil is unusually light, especially for a polymer framed 40 caliber pistol. The 15 round magazine puts a lot more fun between reloads. The white 3-dot sights were easy to see, and made target acquisition quick. At 7 yards I could easily keep within a 5 inch grouping, but I found it impossible to stay in the black at 25 yards, although I did stay on the target. Still, I found the M&P to be a very respectable tactical weapon. I found the loaded chamber "indicator" to be somewhat useless. I was impossible to see into the breech hole in low light conditions, and took to much time to align and look even in decent light conditions. I found It was quicker to just pull the slide open a bit to see copper in the loaded chamber, although this was a two-handed effort. Our initial issues with this particular sample not withstanding, when it came to from, function and shooting experience, the score ended up in the plus column. This gun is a definite keeper in our collection, indeed worth its value. This new double-action-only polymer frame pistol is touted as a "pistol for the new century" by American Rifleman magazine. Reinforced polymer chassis, superior ergonomics, ambidextrous controls, proven safety features. The manufacturer states that in designing the new M&P they considered the needs of military and law enforcement from every conceivable angle. 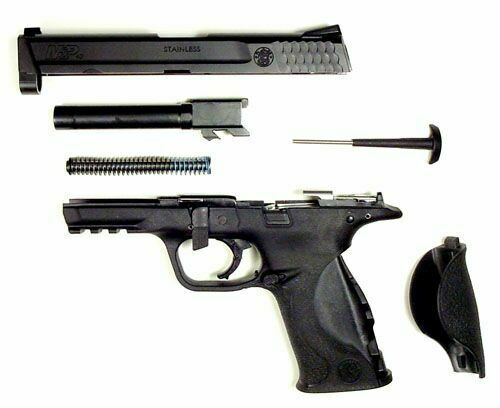 The M&P taken down to its field-serviceable components. There is no active loaded-chamber indicator. 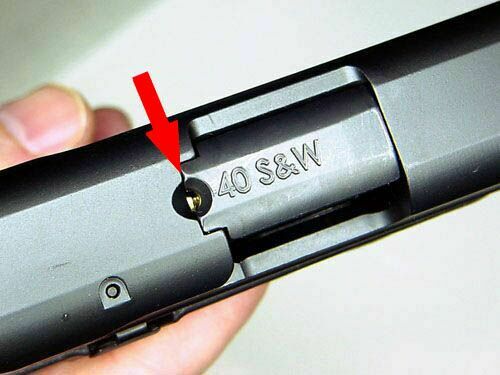 Rather, a hole is carved down from the top of the slide where the barrel's chamber meets the breech-block that lets you see brass if the chamber has a cartridge in it. The frame is made from a material called Zytel, a DuPont polymer designed for extreme environmental conditions. The stainless steel barrel and slide have a Black Melonite finish, the result of a high temperature treatment process called nitrocarburizing. 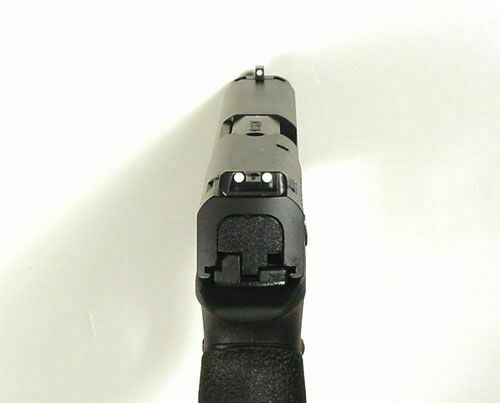 Here you can see the characteristic "fish-scale" slide grip serrations, the fully recessed slide lock lever, and the location of the optional integral gun lock. The grip's interchangeable palmswell inserts are held in place by a special retainer pin that also serves as a tool for removing the slide. 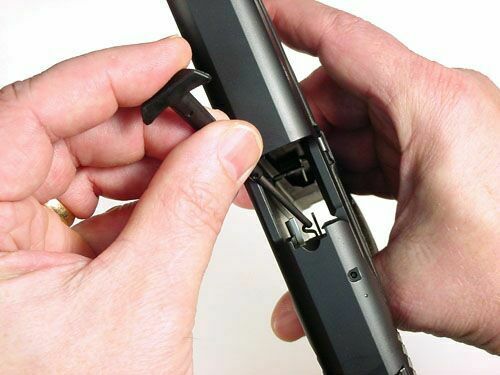 The palmswell insert retainer pin can also be used to lower the sear deactivation lever inside the open breech, a step required in order to remove the slide. Recessed control levers allow for a smooth, slim gun profile. 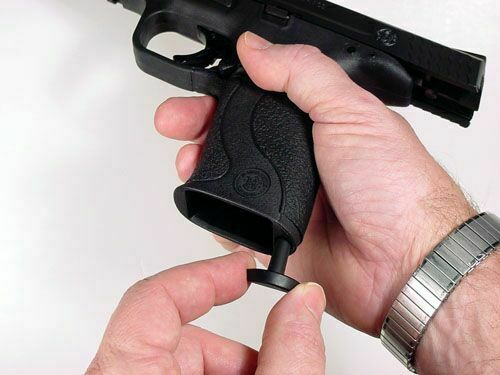 The M&P has a trigger safety mechanism similar in concept to the Glock, although different in design. Palmswell inserts adjust for a small, medium or large grip size. A hint of things to come? 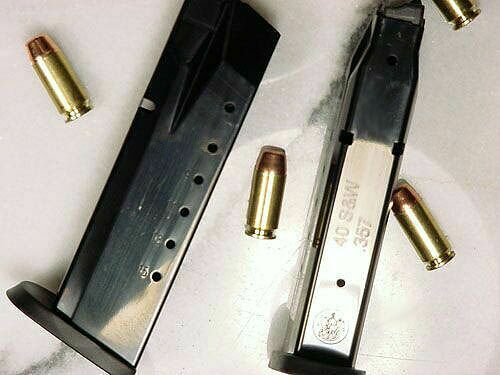 Dual designations on the magazine may elude to a possible future barrel swap for the popular 357 SIG cartridge. 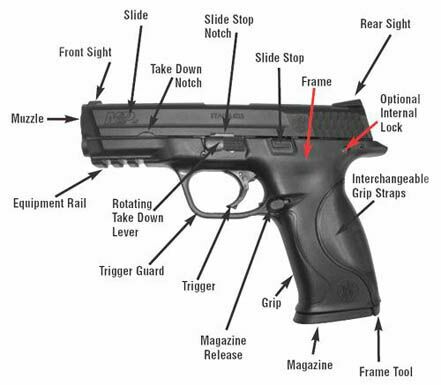 This is the closest thing you will find to an exploded view in the M&P owner's manal. What's the price of 40 S&W? Check our Handgun Information Database (from the main menu click Database/Manufacturers) for market pricing of any given gun.